US researchers found a molecule produced in the intestine when soy is digested stops a hormone which can fuel prostate growth or cause baldness. Writing in the journal Biology of Reproduction, they said the finding could explain why Japanese men, who eat more soya, rarely have prostate cancer. They said the molecule could be used as a treatment for cancer and baldness. The team found that the molecule, equol, "handcuffs" the male hormone DHT - a by-product of testosterone. The researchers say this could be particularly important for men who have been diagnosed with either an enlarged prostate (benign prostatic hyperplasia), or cancer of the prostate. 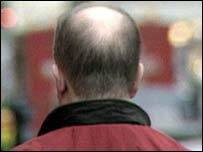 DHT has also been implicated in research into the causes of male pattern baldness. Other drugs developed in recent years aimed at blocking the effect of DHT have been developed. But these drugs, which stopped an enzyme converting testosterone into DHT, were found to cause side effects. The US researchers found equol does not prevent DHT from being made, but it does stop it functioning. They carried out two experiments on rats which showed injecting equol into male rats reduced the size of the prostate. In one, the testes of male rats were removed, so they produced no DHT. When investigators injected DHT into rats, their prostates grew. When they injected rats with both equol and DHT, the equol prevented the DHT from functioning as it normally would - as a stimulator of prostate growth. Professor Robert Handa, from Colorado State's College of Veterinary Medicine, who led the research, said: "Directly binding and inactivating DHT without influencing testosterone gives equol the ability to reduce many of the harmful effects of androgens [male hormones] without affecting the beneficial ones." Dr Kenneth Setchell, of Cincinnati Children's Hospital Medical Center, who first identified the potential of equol 20 years ago, said: "These findings are of immense clinical importance because blocking the action of the potent male hormone DHT has been one of the holy grails of the pharmaceutical industry as a strategy for treating prostate cancer and other related diseases." He said the soy molecule did this "very effectively." A spokesman for Cancer Research UK told BBC News Online: "One third of all cancers are thought to be linked to diet but it is not known exactly which components of our diet protect against cancer or indeed place us at increased risk. "We do know that countries with a high intake of soy in their diet, such as Japan, tend to have lower rates of prostate cancer and some other types, with the active ingredients in soy thought to be isoflavones. "There's a lot of research into whether isoflavones can be used to prevent the spread of prostate cancer, which usually develops slowly." He added: "This study is interesting in that it raises the possibility of using a metabolite of isoflavones as a preventative agent against prostate cancer, which is now the most commonly diagnosed cancer in British men."